Quilt Description: This colorful wall hanging was made using the adorable pattern generously provided by Quilt Designer Sandy Harris of Sundrop Designs. Please abide by Sundrop Design's guidelines if you wish to make a quilt using one of their free patterns. This quilt was donated in 2011 to "Freedom Guide Dogs Silent Auction" to help raise money for this valuable organization. For a complete list of all kinds of organizations that need donations of handmade items, artwork, quilts, fabric and related items, please see Helping Others Using Your Creative Skills in our Article Section. 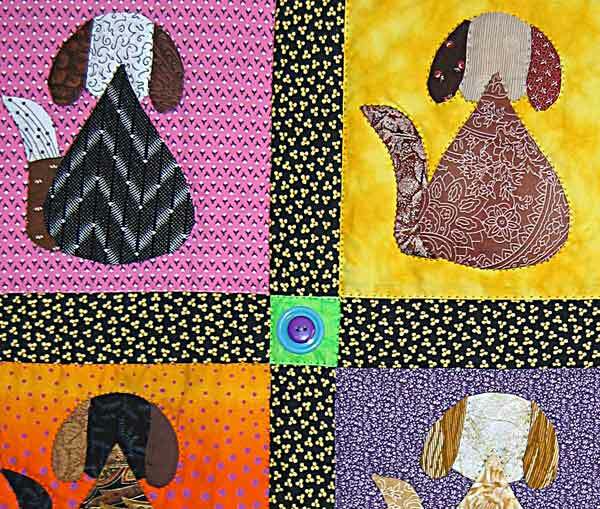 For more dog related links and resources, please visit our "Dogs & Quilts" page. Materials: Cotton Fabrics, Embellished with Yo-Yos, Buttons. Techniques: Hand Appliqued, Machine Pieced, Hand-Quilted, Embellishments Attached by Hand. Detail photo of "Dog Daze"